Refreshing and easy to make, this smoothie provides almost twice the amount of vitamin C you need for an entire day! The sweet sip also delivers tooth-strengthening calcium and vitamin D from the milk…and all for only 155 calories. 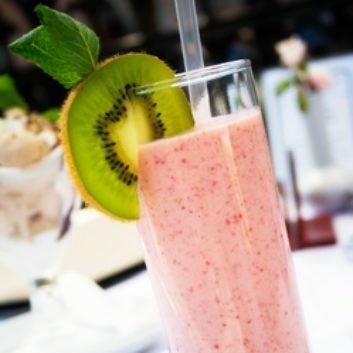 In a blender or food processor, combine the milk, strawberries, kiwis, chopped mint, sugar or sugar substitute, and ice and blend until smooth. Garnish with fresh mint springs, if using.